Attorney Richard Schulte, left, of Vandalia talks with the Sidney-Shelby County Board of Health following an hour-long executive session Wednesday. His clients, leaders of the Amish families in Maplewood, purposely stay out of camera range near Schulte due to their religious beliefs. The health board is taking legal action to enforce non-compliant health standards on their properties. Board members, left to right, include Aaron Sargeant, Dr. Matthew Vasko, Jim Hemmelgarn, Ted Holthaus and Bill Gosciewski. 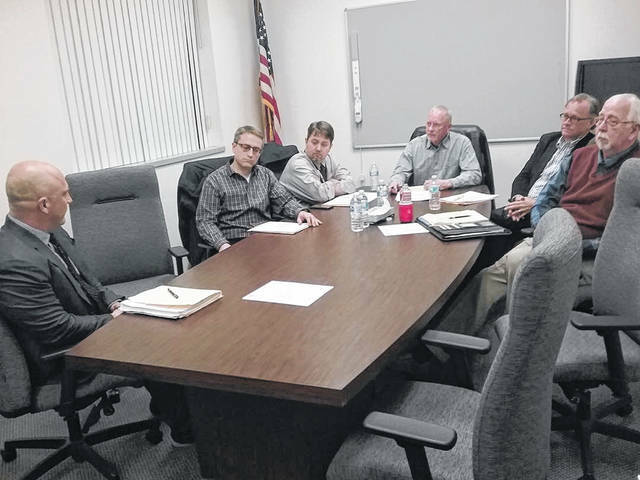 SIDNEY – Continued inspections, negotiations, fact reviews, etc., along with an hour-long executive session Wednesday night, resulted in no definite plan by members of the local health board to resolve issues with four Amish families near Maplewood. It focuses on the lack of chemical treatment of human waste before it is applied to their crops. It appears a court battle may ultimately be needed to wipe away the dispute. More than 50 people jammed the lobby of the Sidney-Shelby County Health Department in support of the Amish families who remain non-compliant on disposal issues on their properties. Following the executive session that opened the meeting, several Amish bishops, their attorney, and an advocate, were among a handful of others in the small, crowded meeting room. The hoping that the board had reached a compromised agreement left the visitors disappointed. The disputes have been going on for nearly two years, but it was late last year when the health board took legal steps. On Oct. 23, 2018, the Sidney-Shelby County Board of Health filed civil lawsuits against four Amish families near Maplewood. The board is seeking that land owners bring their properties into compliance with state health guidelines, or have the buildings condemned and vacated. The ongoing dispute centers on the alleged lack of action by the property owners to remedy their sewage handling system to prevent potential health problems for themselves and adjacent properties. In countersuits filed by the Schwartz families, they are not seeking any compensatory or punitive financial awards but are asking the be allowed to live as their religion tenants state, including a sanitation system as they wish to build. On Wednesday, board president James Hemmelgarn asked for input from the Amish leaders. The bishops chose not to speak, but attorney Richard Schulte of Vandalia and Jeremy Fryman of Marion, Ohio, did make comment. No one from the Amish community or their representatives were asked to be part of the executive session. No board member offered anything that resembled a solution, just a statement of their role as board members to protect public health. Schulte asked board members to fully consider the beliefs of the Amish community in enforcing building code and sanitary guidelines. He questioned the enforcement practices used to “force compliance”. He further told the board they were denying the Amish religious freedom by forcing them to comply with sanitation orders or have their properties condemned. Fryman, who is an associate professor of business at Marion Technical College, told the board they were being watched on how this matter is being handled. He noted it has reached national news outlets. Fryman questioned why solutions to these problems in other counties can’t be duplicated in Shelby County. Schulte said solutions include not applying the fertilizer near waterways. Hemmelgarn said the board had already granted several variances on property issues and attempts to seek a solution for nearly two years has proven futile. On Sunday, Jan. 13, Shelby County Prosecutor Tim Sell told the SDN that all efforts taken by officials is to use a priority to maintain the Amish way of life. He said that some variances were able to be approved with their lifestyle in mind. However, not maintaining a healthy environment for the themselves and other area property owners, is something that can’t be accepted. Sell said the privy issue involves the use of human waste as fertilizer of their crop land. According to guidelines, the waste must be collected from a concrete collection pit by a certified treatment company. A certain amount of chemicals need to be added to the waste to kill all bacteria and enable field application. As noted by Schulte on Wednesday, the Amish want to bypass the treatment process and apply the waste directly. Bypassing the treatment puts the family and possibly neighbors in harm’s way with the contaminated fertilizer. Schulte, who is taking the case pro bono (for free), said if the issue can’t be settled they were willing to take it to trial. The matter is next on the Shelby County Common Pleas Court docket for hearings on March 26-27. • In late 2017, the health board received a complaint through the Salem Township Board of Trustees regarding “the disposal of human waste and improper plumbing in a dwelling on the property”. It included new structures and existing building converted into living quarters, all without approval of the health department, township trustees and the Shelby County Building Department. • In December 2017, health inspectors found failures for not having a proper residential sewage system installed, for having no gray water recycling system, and, improperly installed or altered plumbing due to no permits. • According to the Ohio Department of Health through Administrative Code: Chapter 3701-29, it states, in part, “Gray water discharged to all gray water systems shall only consist of domestic type flows having the consistency and strength typical of gray water from domestic households. The source of gray water may include water from bathing, showering, washing clothes or laundry sinks, but not soiled with human waste. • On Feb. 15, 2018, Joseph Schwartz met with health officials and informed of the violations. Discussion of permits, variances, and other remedies was held. No action was taken by the Schwartz family, according to court records. • In a letter dated April 5, Shelby County Assistant Prosecutor Eric Ambos wrote a letter to the family giving them formal notice to correct the problems. On May 11, Joseph Schwartz requested a variance for the properties.